Gaultheria is an evergreen shrub, which produces some of the best winter berries for pots, hanging baskets or flowerbeds. Gaultherias do well grown in acid to neutral soil, like rhododendrons and pieris. For use in a pot or container, mix in lime free or ericaceous soil. It prefers partial shade and if planted in full sun make sure the soil is moist. We discovered a large Gaultheria mucronata ‘Mother of pearl’ in our garden. It was hidden behind a pillar at the entrance amongst escalonia and hedging and remained unnoticed until its berries became visible in our first or second autumn in the house. It produces masses of beautiful pale pink marble-like berries from September throughout winter into late spring. I have used its foliage for flower arranging as the narrow stem contrasts well with the larger floppier evergreens such as holly and Elaeagnus. The berries are great for using in flower arrangements too although the red-berried Gaultheria procumbens is probably more appropriate at this time of year. I visited Ballyseedy Home and Outdoor living recently for the first time. For a gorgeous shopping experience it is the place to go to with Meadows & Byrne there as well. The gardening centre is really well stocked with wonderful grasses, phormiums, heathers, skimmia, solanum – plenty of the valuable evergreens which provide striking winter colour and interest. There are great gift ideas at Ballyseedy and not just for the green-fingered. 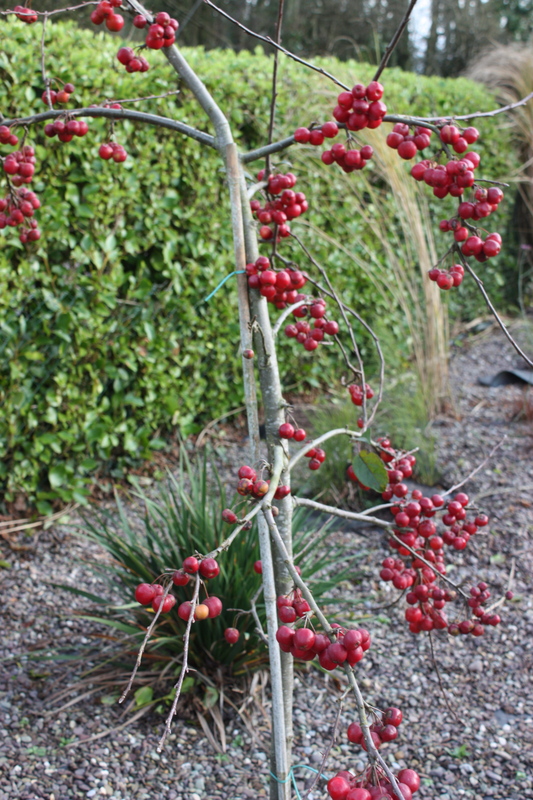 They have traditional ponsiettas, two for €20 and stunning Christmas Berry trees (miniature crab apple), Malus ‘Red Sentinel’ for €29.99. 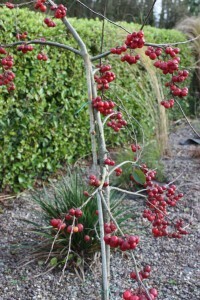 This little tree with its ruby-like fruits makes a beautiful indoor plant over the holidays. Just make sure you plant it where it will be visible from the house like my one (see photo) when you move it outside in January. For something really different you could treat someone to a lemon tree for their sunroom or conservatory. A lemon tree is relatively low maintenance and the scent can be gorgeous around the house. It is best to use mainly acidic soil for one of these. Apply acid loving plant food from April to September and keep slightly moist during this growing period as well. The lovely thing about Ballyseedy, Hosfords, Griffins and so many gardening centres nowadays is the availability of an on-site café. I for one always find it easier to focus after a cup of coffee and a nice slice of cake! So even if its only the goodies you are after, drop into one of these beautiful Irish owned businesses over the next few weeks for a browse and a cuppa –you never know what you might come away with!